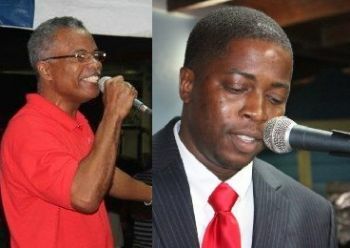 ROAD TOWN, Tortola, VI – Even as the official result of the 2015 General Elections has not been declared as the long and tedious counting of the Territorial At Large votes continues, President of the Virgin Islands Party (VIP) Mr Carvin Malone has congratulated the National Democratic Party as the elected Government and said the party will definitely be doing a postmortem to see which areas the party needs to strengthen in going forward. The NDP has already won 7 of the District seats, which is enough to give them the Government, and seem headed to sweep the four At Large seats and a 11 to 2 landslide win. 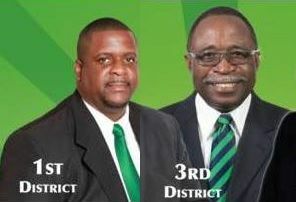 Among the District seats won are District 2, which was contested by first timer Melvin 'Mitch' Turnbull, and District 9, which was contested by Dr Hubert O'Neal. “I would like to congratulate the National Democratic Party for fighting the valiant fight. 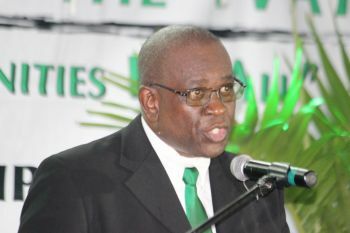 A fight which they actually presented their case to the people of the Virgin Islands and it was overwhelmingly accepted and we have to wish them the best in moving this country forward,” said Mr Malone. In speaking with this news site late last night, June 8, 2015 as he joined many others to witness the counting of the Territorial At-Large ballots and that of the Ninth District, Mr Malone said there are many issues that are currently confronting the country for the next few years but will require the input of everyone. “There are a lot of hopes and expectations that the people of the Virgin Islands would seek to get from a particular government and they just have to be vigilant in terms of sure they can do it to the satisfaction of the voters, the ones who have expressed their confidence in them,” he said. As for the return of Honourable Julian Fraser RA, the Virgin Islands Party Chairman, and senior party member Honourable Andrew A. Fahie to the House of Assembly, Mr Malone said the two men would have to continue to do their job for the people who have again put their confidence in their representation. “Winnings has its benefits and losing has its pains but the fact is there is a constituent in the Third [District] and one in the First [District] that must be served so they would have to continue to advocate for and on behalf of all the persons not only in the districts but throughout the territory,” said Malone. The VIP President said, however, that the bigger picture is that there is a procedure which, even if it is practiced as a norm, cannot be the norm if it’s not in the act. “The Act does not allow for any re-opening of sealed packages or if you do not seal then they have to be sealed in the presence of all those involved. Mr Malone agreed that there were very many persons who did not vote and said that is something that has to be worked on. The people have spoken. Congratulations to the the ndp !!!!!! It is time for healing. The true spirit of a warrior is not only proven in victory but is also tested in defeat. Many hurtful words were spoken and hurtful deeds were done . Let us make our wrongs right and throw our support behind our government. I must now retire this name. God bless these beautiful islands. The VIP did not lose the election because of little time. The VIP had Fahie and Fraser in the HOA making a lot of noice for the last 3.5 years. So throw away that reasoning. They been campaigning for the last 3.5 years. The VIP party had a weak team (particularly At-Large), an incoherent message which focused more on the NDP and less on what the VIP would do (never a good strategy) for the territory and a controversial leader. Candidate recruitment- you had 3.5 years to pick a slate of candidate and still came up with a weak team. Change of leader-and this does not mean replacing Fraser with Fahie. Lay out a coherent vision, which is more believable. You cant be making promises that costs a lot of money and not say how you will finance it. The VIP knew elections were due in a maximum of 6 months, launch your campaign early and take your message in every nook and cranny of the Territory. You don't need to wait on an election to launch your campaign. Observer is correct. VIP Fahie and Frasier did so much mud slinging at NDP to make themselves seem like they were the good ones, that they forgot the people who have common sense was sick of their noise. Big mouths, not humble to the territory at all. They really thought people were stupid enough to forget why they were put out the first time and why they are STILL OUT this time. Landslide is a joke, this was an avalanche, this is a way of saying VIP just retire. Was this done to NDP in 2007? The world is a cycle...careful what goes around comes right back around. ...And around and around which people don't get. These positions are not sealed in stone - nor anything else and soon enough the displeased with kick up again. Lord help our little islands. Stop this nonsense now about VIP didnt have time to campaign, VIP had 31/2 years to be doing this. VIP was not prepared and this is the results, so dont blame nobody for your own short comings. From last election you should have been preparing. So tell the people if a crisis had to come would it call Fraser and say im coming so be prepared? You think we wanted an unprepared person to lead our country when you can even prepare for an election. Come on? Instead of looking into other people's dirty laundry you should have been preparing. So stop the crying and take the licks the NDP prepared for you! That is exactly why fRASER STILL THERE! I mean I already see the pictures. I don't think more time was needed. You just have to be prepared and this was not the case for some candidates. It is common knowledge that elections are due every 4 years, therefore one cannot wait until the year prior to begin preparation. Congratulations to all!
" You can fool some people some of the time but you cant fool all the people all the tine" - Abraham Lincoln. The people have spoken...Congrats NDP. much better than funny man! Celebrate now...cry later. Victimization is NOT a joke. Selling out of our country to the highest bidder is NOT a joke. Establishing a culture of disrespect is NOT a joke. We will remain silent, listen out and hear. It is all just a matter of time... and THAT as they say, is "longer than twine". joking, they laughing. We can hear them clearly. Now will soon be over. Lets call it what it is a "landslide"
4 more years in the wilderness for VIP; but please be informed there will be another election come 2019, so don't use the excuse about a snap election when that time role around ( you have 4 years advance notice)...what a mash up!!! Yes let the healing begins and let all those who were defeated to rejuvenate and come again. Work on your strengths and weaknesses. To the VIP party let NDP right the wrongs that they have create leading up to this elections and if they don't at the next election the people are gonna speak again.Remember the election is for by at the people. Now all of you need to take to the beach and take a nice cool down. Any coach will tell you to do just that. NDP must get cracking and don't wait until 2019 the 9th hour to start working on projects. Action does speak louder than words. I am one to call a spade a spade! NDP won this election in some districts because they had the government's money to spend to buy votes and that is a FACT! I know I will get a lot of flack for it but oh well. Imagine giving one of their supporters $25,000.00 for a bogus claim in order for him to use that money to assist "The Switch" with his campaign. Imagine you coming to my house and when I express that you do not have my support you ask me what I want and before I even knew what hit me, that wish was granted. All now I sure the Treasury still processing payments for "financial assistance" for persons who I am sure just need to look hard work to do. Imagine people from all parts of the world were bought airline tickets to travel home to vote from as fas as the UK to my knowledge. This is unprecedented. And to think they used to talk about the VIP. This should tell us that it was truly their intention to "do whatever it takes" win this election as said by our 'Honourable' Premier. Whoever wants to be fooled by the NDP go right ahead but the writing is on the wall. We will be hit really hard with extra taxes shortly to cover the cost of these loans that this government took to fund their campaign. Only they could have known what they were up to when they borrowed this 16M to suppposedly do improvement to the road infrastructure in the territory. By that I guess they meant paving roads that didn't need paving and digging up roads that were badly in need of fixing. Lord help us! Anyhow my good people...brace yourselves...we are in for a rough ride! How you didn't notify the public before elections, why u bringing up now ??? Oh please!! Stop going on like only NDP was doing it, VIP was doing it also! Whether NDP, VIP, PPP, PEP, PPA, POP, or who get in and we don't like it we always, ALWAYS!!! tend to bash. All you have to do is, next time go vote for who you want in. I'm sure most of you on here who bashing parties either voted against them or didn't even vote at all. So keep calm and observe for the next 4 years and when election time comes do what you feel you need to do. Honestly we couldn't remove a functioning government for that mess the VIP was preaching, Fraser & Fahie will be good opposition maybe they needed more help there but they are on the right side for now. @tell it like it is: First of all if you are such a loyal VIP fan why did you take it, that alone to show you how crooked you and all them who take from NDP are. That is why you all lose by a landslide. Stop encouraging wrong this is one of the main reason your party loseeeeee. I am not and never have been a loyal VIP fan. The situation I spoke about with the wish being granted was not me personally but someone I know, that was not clear in my post. I have never been offered anything from any politician for a vote and I do not intend to ever accept anything from them because my vote can not and will never be bought by the highest bidder. I think that is just totally distasteful. My country is worth more than that. Other commenters speak about notifying the public before elections about what was going on but what would have been the point? The power of the almighty dollar is far stronger than anything I could have said. It would not have made a difference. Anyhow, no need to belabour this issue, I have said my bit and the rest is left to be seen! The fact remains this election was a way lower voter turnout compared to 2011. Check some of those reelected with less votes than the last time. It is time to fulfil all the promises that were made. The territory is going to be transformed. Virgin gorda look out a newt clinic soon. The ground has already been broken. Carrot bay,the piles for the fisherman's betty are there. Green land,the plan's for the housing project we're shown by the minister. East end the sewage project all the was to paraquita bay will continue. With $90,000,000 in the reserves our financial future is strong. Remember this government will act quickly since it is a matter of continuation....not starting from scratch. Horray!!!!! Go ndp. You see the 90mil in the reserves or even the 40 mil (which is what i think they claim it is). I refuse to even repeat that figure to sensible people in light of the fact that the government has not audited its books in 3 plus years. NDPv Fraser... NDP wins 11 out of 13 times. They targeted Fraser this entire time and painted him as this criminal/devil (while BTS he is close friends with many of them) and people (the youth) bought it. That affected so many other races/districts that could do with a different outcome. Im very happy NDP won, congrats! Please NDP, put some serious emphasis on the general SECURITY of the country this term. I know its not only a VIP interest. But waittt; Mitch lap raja 28 times lmao. This is it! thank you to all those who stepped up to serve. We still need fresh ideas and new faces. It is hard to fight the machine. Use this time to become visible, do community-oriented service, keep visible, speak up when irregularities and injustices are evident. Congratulations for stepping up. Now let's see if a return win will make the ruling party arrogant or humble.